WASHINGTON -- While the political world and late-night comedians still debate what "covfefe" means, at least one member of Congress is aiming to establish what it stands for. Democratic Rep. Mike Quigley of Illinois has introduced a bill, dubbed the "COVFEFE Act," to require the preservation of a president's social media records. Quigley's bill turns the buzz word into an acronym standing for the Communications Over Various Feeds Electronically for Engagement Act, which would broaden the scope of the Presidential Records Act of 1978 by including the term "social media" as documentary material. 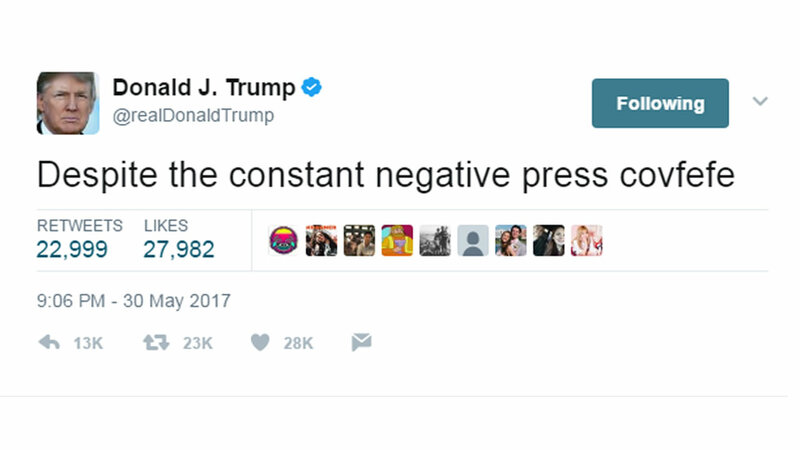 On May 31, President Donald Trump declared at 12:06 a.m. on Twitter: "Despite the constant negative press covfefe." The tweet remained published for several hours before being removed, allowing observers plenty of time to ponder the meaning of "covfefe." But the deletion and others like it have raised questions about how presidents' social media should be handled and preserved. "In order to maintain public trust in government, elected officials must answer for what they do and say; this includes 140-character tweets," Quigley, who co-founded the Congressional Transparency Caucus, said in a statement. Trump's frequent, unfiltered use of his personal Twitter account is "unprecedented," Quigley said. As is, the Presidential Records Act mandates that presidents take all necessary steps to ensure their records are properly documented and stored with the National Archives and Records Administration for public release after they leave office. The law allows exemptions for personal documents, like diaries and medical records, but otherwise asserts a broad scope. A 2014 amendment expanded its latitude to include electronic records but did not explicitly mandate the preservation of social media records. In light of the President's use of Twitter as a daily means of communicating directly with the public, Quigley's bill reignites a long-running conversation about the extent of presidential record-keeping and transparency. "If the President is going to take to social media to make sudden public policy proclamations, we must ensure that these statements are documented and preserved for future reference," the lawmaker said. "Tweets are powerful, and the President must be held accountable for every post." "A few weeks ago, President Trump tweeted the word 'covfefe.' We still don't know what it means, why the president tweeted it, or if it was simply an innocent typo - something we're all guilty of making. "And each time the question is raised whether or not he can legally do that. Because when the president deletes a tweet, it is equivalent to him destroying a record. "That's why I've introduced the COVFEFE Act yesterday. Communications Over Various Feeds Electronically for Engagement. It's a silly name; but it is a serious issue. "By expanding the Presidential Records Act to include social media, it would ensure that all tweets posted by the president from his personal account are archived and preserved; And it would finally answer the question on whether or not the president can delete tweets. "Although the bill name is a little tongue-in-check, the focus of the legislation is more important now than ever. "If the President is going to take to social media to make sudden public policy proclamations, we must ensure that these statements are documented and preserved for future reference. just as Sean Spicer has said, each @RealDonaldTrump tweet should be taken as an official White House statement. "Tweets are powerful, and the President must be held accountable for every post - from commenting on NATO to the Paris Agreement to his Muslim Travel Ban and his response to the devastating terrorist attack in London. And on Monday, we learned that the appellate court cited the president's tweet in ruling against the travel ban. "The president's frequent, unfiltered use of his personal Twitter account as a means of official communication is unprecedented; and we must respond accordingly. Sometimes it takes a creative acronym to drive attention to a much larger issue. "This is the second bill I've introduced this Congress to address the lack of transparency in the Administration. Back in March, I introduced the aptly named MAR-A-LAGO Act to require the White House visitor logs, or visitor logs from any other location where the President conducts official business, to be made public to the American people. Unlike the Obama Administration, the current Administration stated they were unwilling to do so. "For these reasons, it is critical that we push commonsense policy that promotes government accountability and transparency. Because in order to maintain public trust in government, elected officials must answer for what they do and say. That includes 140-character tweets and records of who has the president's ear at the White House, Trump Tower, or his southern Florida home. "If regaining the public's trust is the first step, then taking action to maintain that trust for the long-term is the next. Stand-alone transparency legislation is absolutely necessary, but it is not enough. "We must stop treating transparency and accountability as peripheral issues and proactively incorporate them into everything we do. Going forward, I will continue to promote efforts to increase public access to the federal government and ensure that all elected officials are being held accountable for their words and their actions."